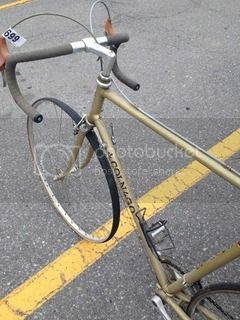 For our Colnago experts....does anyone know the headtube angle on a '77 Colnago Super? Like the earlier bikes, I expect it to vary with the size. Slack for the ver small, and progressively steeper on the bigger bikes. 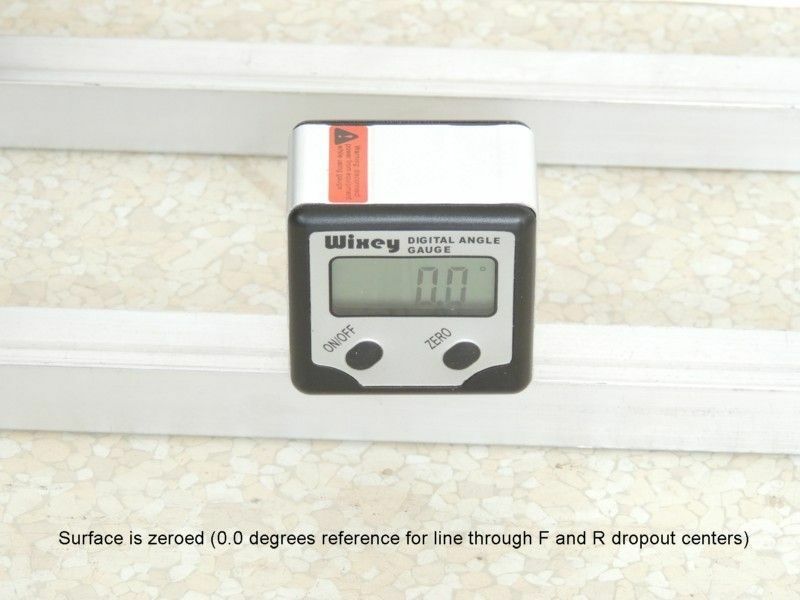 IMHO the easiest way to find the HTA or STA of a frame is to use a Wixey WR300 digital angle gauge. They're cheap and come in handy often. Make sure the front and rear wheels/tires have exactly the same diameter. I am guessing somewhere right around 72-73. Isn't 73.5 parallel the holy grail or something? Isn't 73.5 parallel the holy grail or something? My Cannondale Criterium Series is 74. Love me some steep angles. My Trek 760 is closer to your grail number. If you have an android phone, download the free "Angle Meter" app. On bikes with horizontal top tubes I just zero it on the top tube and then take the angles of the seat and head tubes from there. This eliminates errors due to potential variations in tires, wheels, forks, dropouts etc. I would not assume that a "level" top tube is level. I have run across plenty of bikes that are not, usually the top tube runs "uphill" to the head tube when out of level. Biggest variation i have found to date is 8 mm higher at the head tube intersection from the seat tube, had I assumed the top tube was level, the dimensions would be pretty far off. Note, that the rear wheel was all the way forward in the dropouts, sliding the wheel back will make a very minor difference, but I measure all at the forward position. 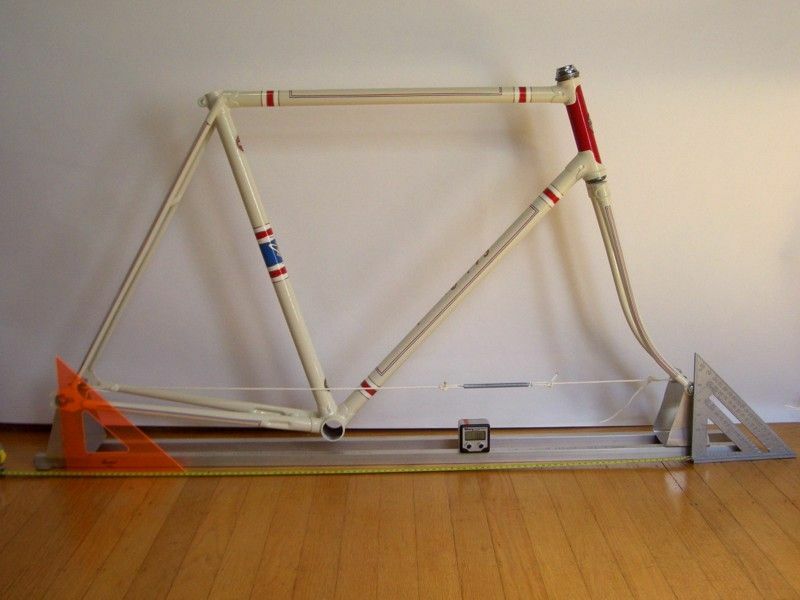 The angle finder is not a bad idea, I would set the bike on a known level surface, I have used a 48" long level on edge and a set of wheels sans tires with matching rims. My conjecture on the 58-59 cm Colnago will be fron 73 to 74 degrees. I knew that the TT was level by design on the bikes I've used it on. However as you say if you are at all unsure about the TT being level then using a level surface as a reference would be necessary. 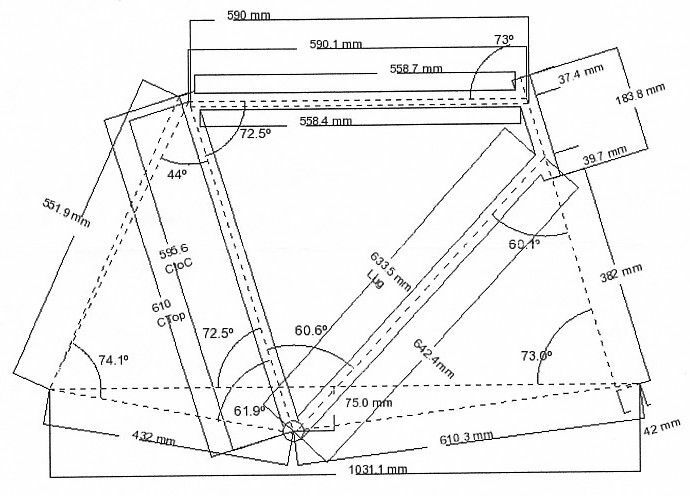 Some years ago I saw a Raleigh factory drawing of a frame that from all appearances had a level top tube, but in fact specified a 0.8° slope. I came to the conclusion that I couldn't rely on a frame appearing to have a 'level top tube' actually having one. The one reference point on a bike frame that doesn't change is a line through the centers of the rear dropouts and the front fork dropouts, and assuming the front and rear wheels have identical rims and tires, by extension the dropouts will be parallel to the floor the bike is on since the front and rear wheels will have the same radius, or distance from the dropouts to the floor. To be 100%+ accurate, if that's what you're after, wouldn't you have to take a measurement of the surface the bikes sitting on, and make sure that's completely level? No need for engineer's accuracy here. Just wanted to get an idea of the angle. I tend toward the steep side so it's all good. Thanx! I've spent my whole life not really knowing what my head angles were. I don't think I've missed anything important. 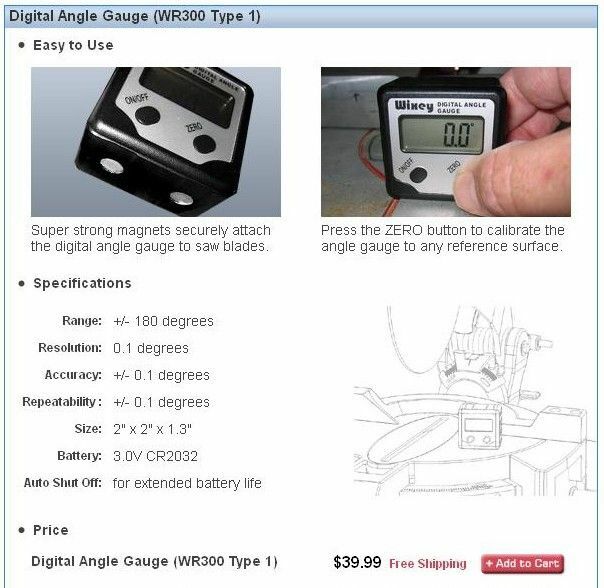 No; that's not necessary with the Wixey WR300 as once the "zero" button is pushed, subsequent angular readings are referenced to the initial "zero" setting. Yes Scooper, most everyone assumes that traditional lugged construction bikes have level top tubes. You are correct. When I measure I made up a fixture that holds the axle centers level, I use it to reference bottom bracket drop too. Kind of a student of bike geometry, I want to understand why a bike feels the way it does. A few takeaways, short chain stays are over rated. A low bottom bracket helps descending much more than I would have anticipated. 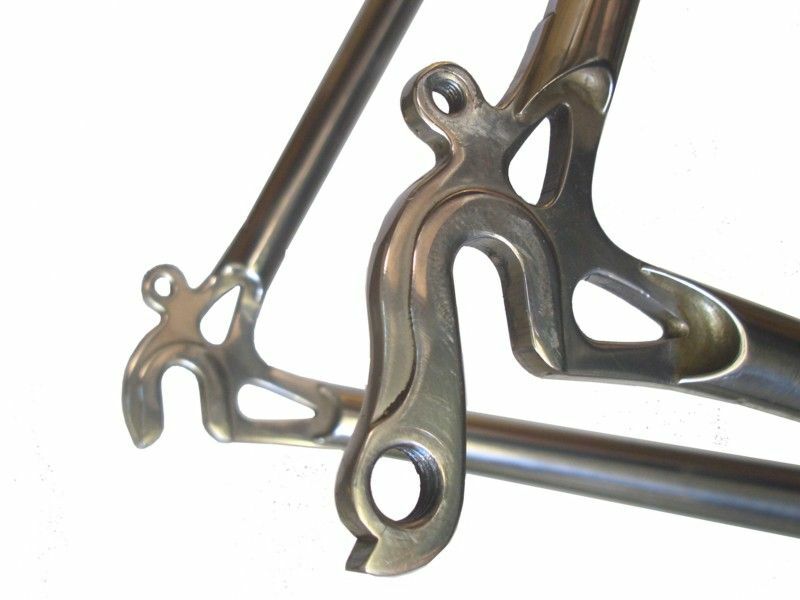 Many modern makers of bikes have bottom brackets higher than I think they need to considering the design of the pedals today provide much more cornering clearance compared to say, the long lived and copied C&V era Campagnolo Record Pedal. I built a pair of axle standoffs used to position the dropout centers precisely the same distance above the floor to do the same thing. My Mom would say, great minds' think alike. 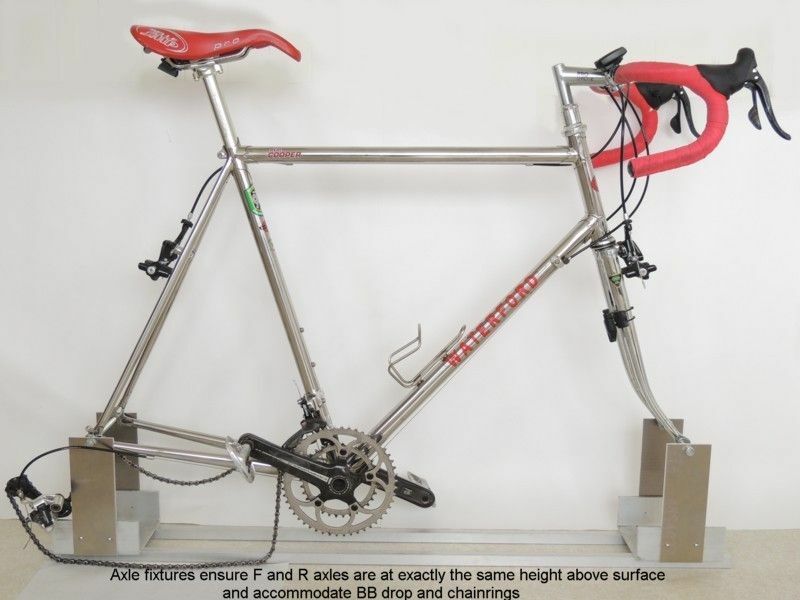 Curious about the question of measuring STA and HTA relative to the top tube and assuming the top tube is exactly parallel to a line through the front and rear dropouts, I measured the angles of my 2007 Waterford RS-22. From all appearances the top tube is level and there is nothing on the factory geometry drawing to indicate a slope. In fact, the top tube has a 0.7° slope down from the head tube to the seat tube. Here's the factory geo drawing. Here is the set-up for measuring the frame angles. Here is the angle gauge "zeroed" to level on the extruded aluminum box beams the axle standoffs are on. Subsequent angle measurements are relative to the axles' baseline. 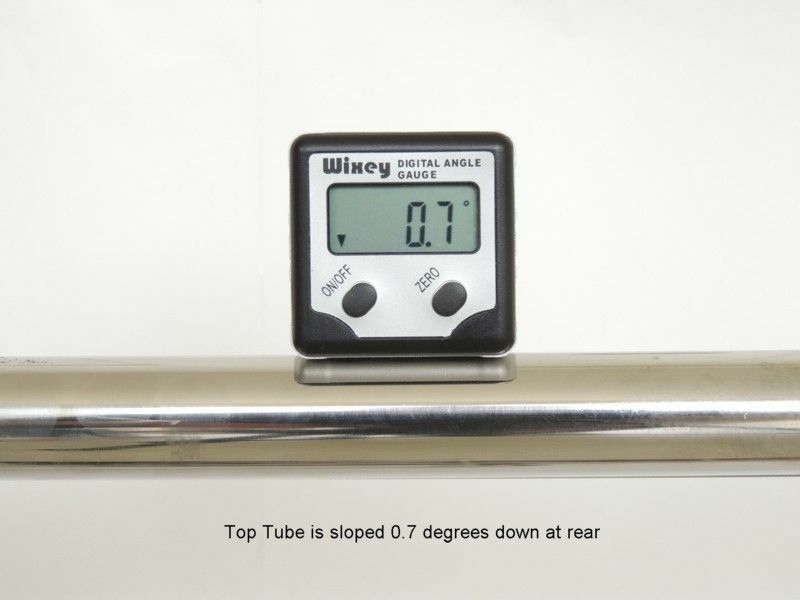 Here is the 0.7° slope of the top tube. 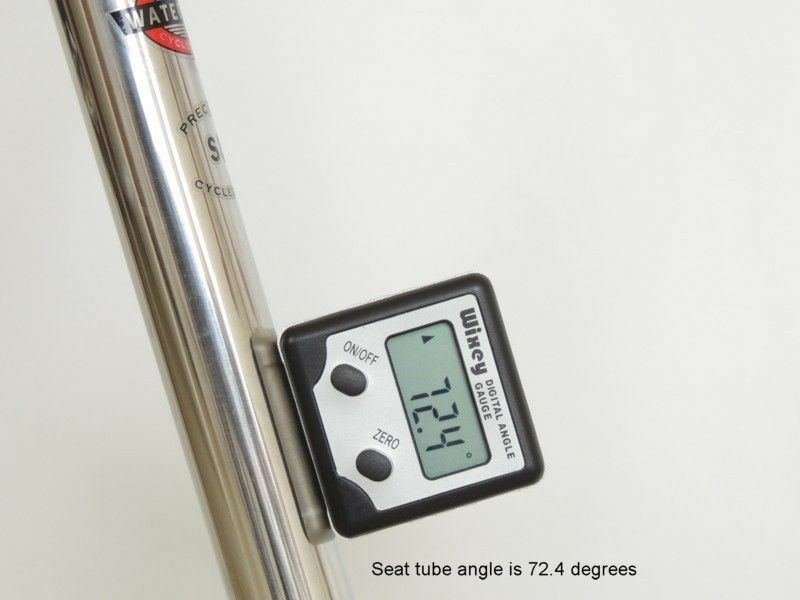 The seat tube measurement shows 72.4° while the factory drawing shows 72.5°. That's pretty close. 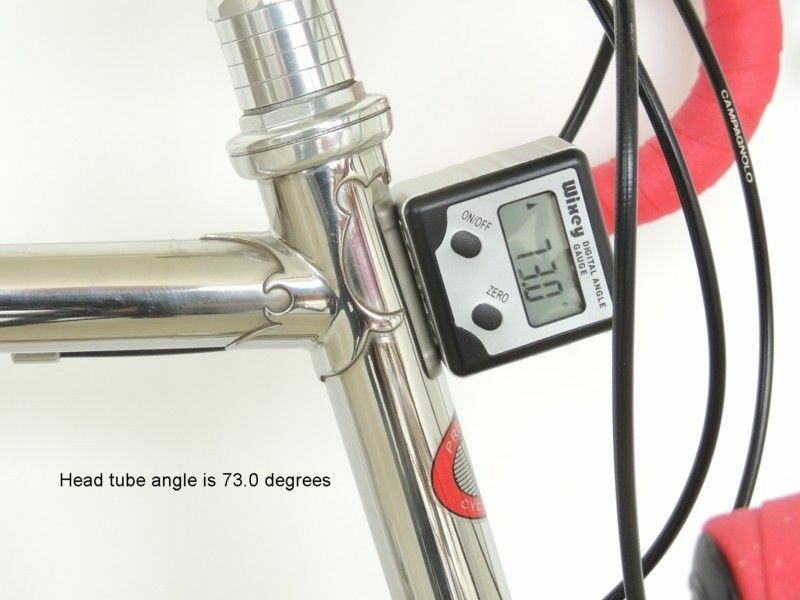 Finally, the head tube measurement shows 73.0°, which is what is shown on the drawing. I was frankly surprised the top tube is sloped, and it's pretty clear trying to derive the STA and HTA by measuring their angles relative to the top tube and assuming the TT is level would result in erroneous results. Very interesting. Horizontal rear DOs are typically sloped so moving the axle forward will lift the rear. Sin .7deg = .012 so for a wheelbase ~1m, that's 12mm. Which is to say you can change it by a significant fraction of a degree with your DO screws. Right. This frame has vertical dropouts, which fixes the baseline vertically. So moving the wheel does little to the rim-brakepad relationship. I looked at that hard when I designed my fix gear with its near 2" wheel travel in the dropout. Went with 11 degrees dropout angle. Less pedal clarance than I likes withthe wheel all the way back (to accommodate a 12t cog) but means using a Velocity Aero semi-deep rim I never having to mess with the brake pad. This thread shows one more advantage of steel frames over aluminum. Cool set-up and tool usage.